Lots of couch time meant lots of binding/editing time last week! This is such a fun quilt. I already have my spot mapped out where I’m going to hang it for the holidays. I like that its bright and cheerful without any “Christmas” fabrics, but is still very festive and whimsical with those pinwheels that look like candy. The quilting was done by Christina and is perfect as always, those tight swirls in each pinwheel totally make this quilt. 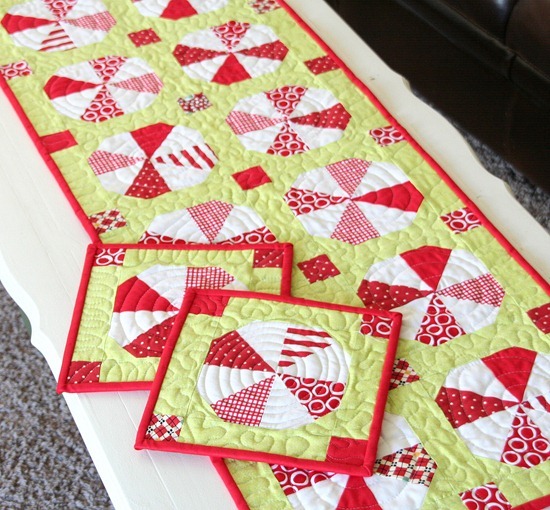 I quilted the table runner and hot pads…which means don’t look to close. The quilt measures 45” x 45”, and the table runner measures 16” x 45”. The patterns includes instructions for both and two hot pads. This would be fun in non Christmas colors too…maybe like green and blues? Or brown and oranges? Hmmmm….like I need another project. The pattern is available in the pattern shop in PDF or hard copy form. Ohhh this would be great in my stash of purple and lime! Oh my that is super cute! My aunt would love that table runner for christmas!! I love this pattern. It would be great in any color combination! Another fabulous pattern. Well done! You could even try it in oranges for pumpkins with stems and leaves appliqued…? I looooove it! I get a minty taste in my mouth just looking at it! Adorable! can't wait to see it in other fabrics. This quilt pattern is super cute!!! Love it! I love that you made a runner and potholders with the same block!!! 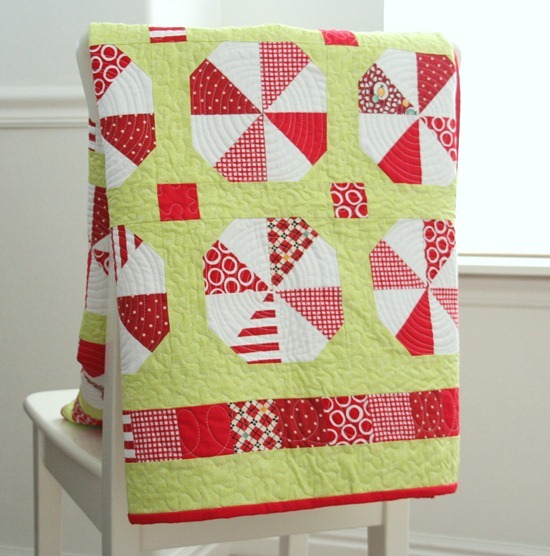 What is the green fabric you used in this quilt? It looks like Kona cotton spearmint. 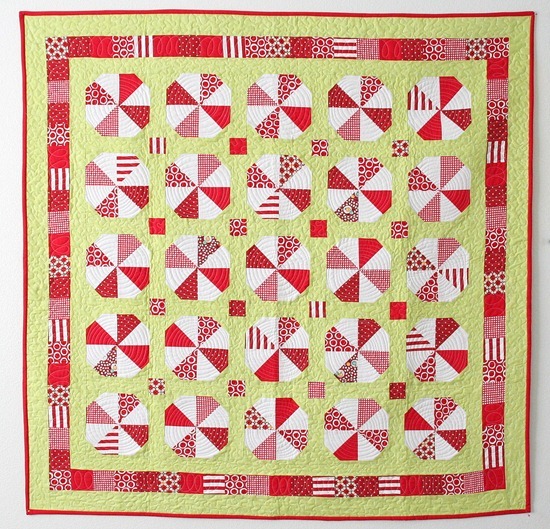 the first thing that caught my eye was the circle quilting on the pinwheels: perfection! love that quilt and the quilting on all of the pieces is great!! LOVELY, both pattern and the fabrics you used! Great idea!! You are GOOD!! okay, i'm usually not a fan of holiday-themed quilts but this is so clever, so fresh, and ADORABLE. I made this pillow, inspired by your applique fall pillow tutorial. Feel free to check it out. I just came across your blog after I was on the blog Dream Home, and I love it!!!!!!!!!!! sorry for all the exclaiming but I thought it necessary, lol. What a festive quilt, I can't wait to dig into your blog more, and feel better, those kidney infections will get you everytime. I got one days after delivering my daughter. Oh! So glad to have discovered your fun blog! Sooper cute! Yes, I do love how it has a holiday feel without being in-your-face holiday. Nice pattern! I love it! It is just adorable! 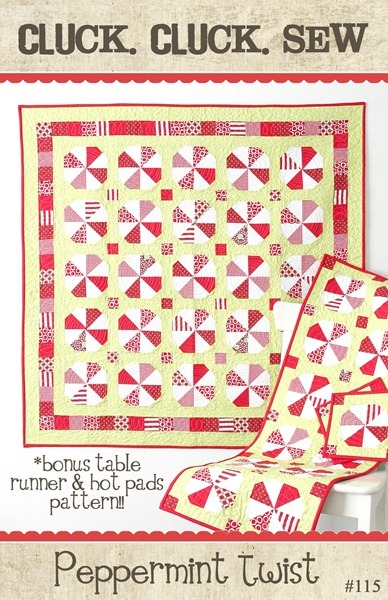 This is a super duper cute quilt, and the table runner is so precious. The quilting job is amazing. I love it. So cute! I'm so glad you didn't tell me it was going to be quilted for a pattern cover shot. :) That would have made it so much more stressful!! It was such a cute quilt to quilt and I love how it's seasonal without being over the top. You did a great job piecing it!